A great Romantic artist, Eugène Delacroix was famous for his optical effects and intense brushstrokes in his masterpieces. He was also a renowned lithographer, and he was able to create exquisite illustrations of the works of esteemed literary geniuses including William Shakespeare, Johann Wolfgang von Goethe and Walter Scott. The artist gained inspiration from the works of Old Masters Peter Paul Rubens, Titian and Caravaggio. He also focused on movement and color in his artworks, instead of merely putting emphasis on modelled form and clear outlines. As evident in his paintings, most of his content were on the romantic and dramatic side. He was influenced by the works of Lord Byron, who was better known for incorporating forces of sublime in his creations. 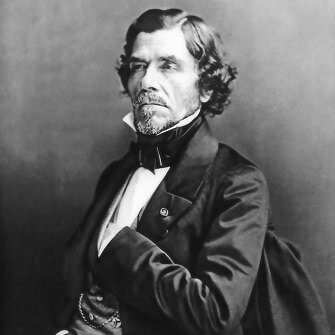 Born in a town near Paris, Eugène Delacroix was the child of Charles-Francois and Victoire Oeben. He had three siblings who were much older than he was. There were some speculations that the Delacroix's biological father was a man named Talleyrand, as Charles-Francois suffered from infertility at the time Eugène was conceived. Moreover, the artist had significant resemblance with Talleyrand, who was a family friend. During his time as a painter, Talleyrand served as his inspiration and guardian. It was believed that this man served King Louis-Philippe, among other prominent figures in France. When Charles-Francois and Victoire died, Eugène was left as an orphan. He was a mere 16-year old aspiring artist at that time. Eugène attended the Lycee Louis-le-Grand and the Lycee Pierre Corneille. Here, he was able to receive much accomplishments and recognitions for his skill in drawing. By 1815, he started receiving training in Jacques-Louis David's neoclassical technique. He was trained with Pierre-Narcisse Guerin. 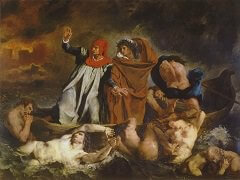 It was in 1822 when Delacroix made his very first major painting, The Barque of Dante. It was inspired by The Raft of the Medusa, a painting by Gericault. The artwork that received much favor from the Paris Salon became a huge sensation, and the State bought it for the Luxembourg Galleries. Two years after, he gained another recognition for his work The Massacre at Chios. The Massacre at Chios was one of the artist's most significant works. It had a somber tone to it, as dying and famished Greek civilians were presented as they were to be slaughtered violently by the Turks. This masterpiece by Delacroix expressed pity for the Greeks, which was also a prevailing sentiment of the French people at that period in time. With his exceptional works, Delacroix became noted as a primary figure in the new Romantic art style, and the State purchased this painting. Some art critics, however, considered his manner of presenting suffering as somewhat controversial as there seemed to have been a lack of any glorious events in that painting. 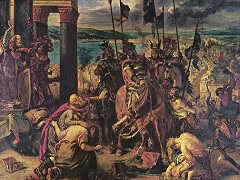 Furthermore, there are those who believed that the tone of the painting was one of desperation, and an artist named Antoine-Jean Gros thought that the image was aptly referred to as the massacre of art. In 1826 Delacroix created another painting with similar theme, Greece on the Ruins of Missolonghi. It expressed support for the Greeks as they fought a war for their independence. 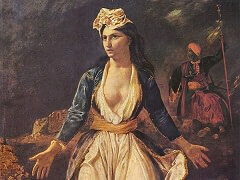 It presented the capture of the Missolonghi, which was by the Turkish forces. The painting featured a woman who was clad in Greek costume, and her arms were raised to implore a certain gesture prior to the grim scene. This artwork focused on the suicide of The Greek people, as they preferred to kill themselves instead of succumbing to the Turkish forces. 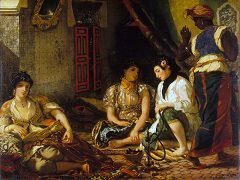 By 1826, Delacroix began to explore other painting techniques, and he began making romantic artworks with varied themes. In 1825, he started creating lithographs that illustrated Shakespeare and paintings by Goethe. Woman with the Parrot and The Combat of the Giaour and Hassan, which he painted in 1826 and 1827 presented themes of sensuality and violence, which were recurrent at that time. In 1827, Delacroix present another masterpice the Death of Sardanapalus in Salon. It depicted the death of King Sardanapalus, who was an Assyrian king. The artist succeeded in creating a scene that was emotionally stirring and powerful at the same time. In this painting, the beseiged king was presented as merely watching the guards as they carried out the king's orders to kill the animals, his concubines and servants. This calm detachment that was evident in King Sardanapalus was a typical theme in Romantic imagery. Although it was quite an impressive work, it was not exhibited for a number of years because critics considered it as gruesome and involving themes of lust and death. Nevertheless, it was the artist's choice of exotic colors and strong brushstrokes that made this painting appealing and surprising at the same time. 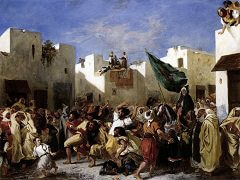 In 1822, Delacroix was unknown to both public and critics. Five years later, he was a famous artist, one of those at the center of the French School, an artist who mattered, even if his works were harshly criticized or severely judged. Three paintings, deliberately planned, had progressively brought him to the fore: The Barque of Dante, shown at the Salon of 1822; The Massacre at Chios in the Salon of 1824; and, in 1827-28, The Death of Sardanapalus. These three paintings have several basic characteristics in common: their format (they are all very large), their genre (they are all history paintings), and their initial conception (none was commissioned; all were done specifically as "Salon paintings,"). In his later career he became one of the most distinguished mural painters in the history of French art. His Jacob Wrestling with the Angel and The Expulsion of Heliodorus from the Temple are among the maturest expressions of his decorative richness of colour and grandiose structural integration. 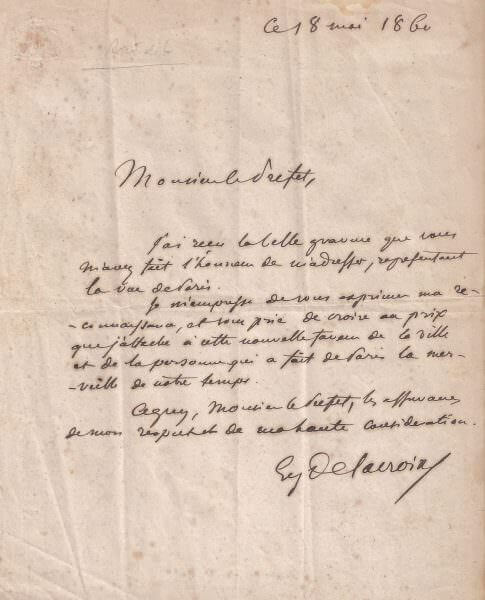 "nothing can be compared with the emotion caused by music; that it expresses incomparable shades of feeling"
At one point during his life, Delacroix befriended and made portraits of the composer Chopin; in his journal, Delacroix praised him frequently. 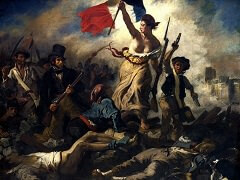 With his failing health, Delacroix died in 1863, leaving more than 6,000 drawings, watercolours, and prints to be sold. His Journals are among the most penetrating of artists' notebooks since those kept by Da Vinci. A pivotal figure in the history of nineteenth-century art, Eugène Delacroix stands both at the culmination of the great painterly tradition of Titian, Rubens, and Rembrandt and at the beginning of something quite new and modern, as witnessed by the reverence given him by artists of following generation who were so profoundly influenced by his works: Renoir, Cezanne, Picasso, Matisse, and especially Van Gogh, who avowed admiration for the paintings of Eugène Delacroix with his use of Prussian blue and citron yellow in his masterpiece Starry Night.